A unique product offering incredible value – The Europa Horizontal Curve Pop-Up Wall is a vibrant full colour fabric double-sided print tensioned onto an aluminium tube framework. Very easy to erect by a single person. Replacing the fabric print is simple when required. 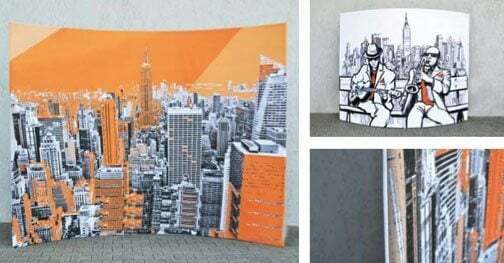 A unique product offering incredible value – The Europa Horizontal Curve Pop-Up Wall is a vibrant full colour fabric double-sided print tensioned onto an aluminium tubular framework. Very easy to erect by a single person. Replacing the fabric print is simple when required.